This bright, sunny day has me thirsty for a refreshing cocktail. Ted Haigh has come to the rescue yet again. You may recognize this as an Aviation; we’ve subbed grapefruit for lemon. 1 3/4 oz. gin (I used Seneca Drums), 1/2 oz. maraschino liqueur (I used Finger Lakes Distilling Cherry Liqueur), 1/4 oz. grapefruit juice (I used ruby red). Shake all ingredients over ice and strain into chilled glass. Garnish with mint. 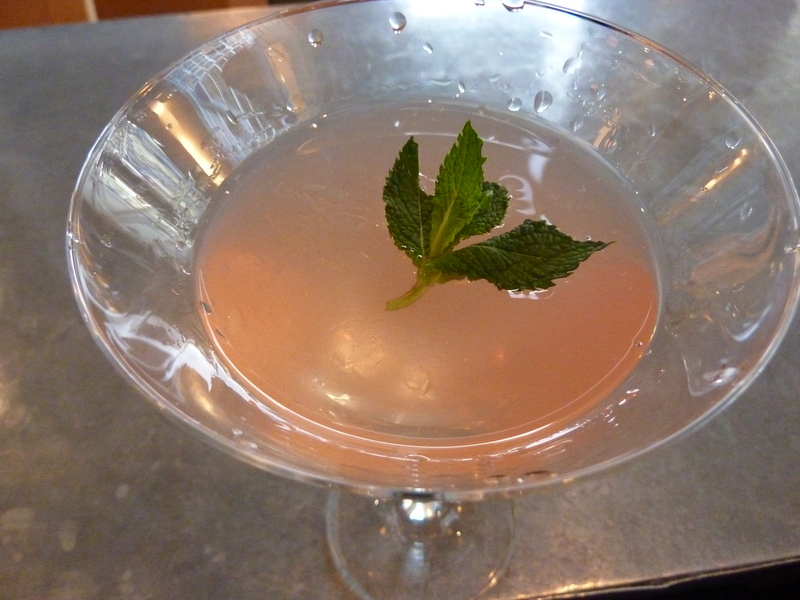 The cherry liqueur I used was quite tart, which prompted me to substitute the sweeter ruby red grapefruit juice. The mint garnish is a touch of genius, playing off the herbaceousness of the gin and cutting through the sweet-tart combination of cherry and grapefruit. I couldn’t find much on the history of this drink, though “Seventh Heaven” is the name for all sorts of other interesting things like a revolving restaurant in the Ostankino Tower in Moscow, a frequent flier program for Air Jamaica and a Dutch romantic comedy.